Elements of cost is divided into three parts. Material cost, Labour cost and Expenses. 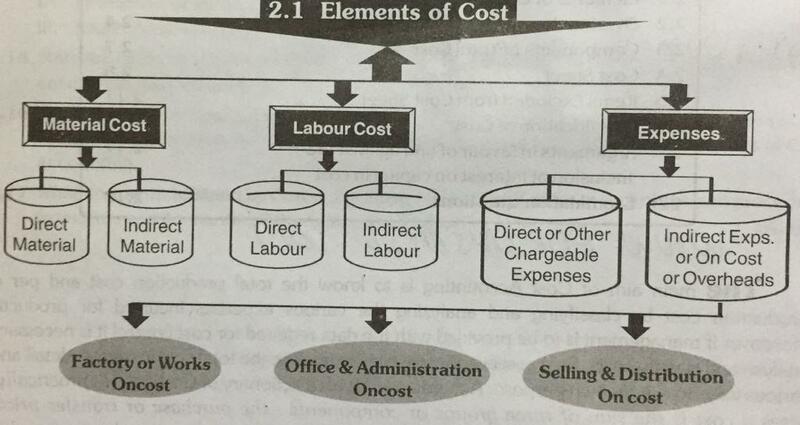 Which is further divided into direct and indirect cost. A. Direct Materials : No commodity can be manufactured without material. Whatever is spent on material becomes the part of cost of that commodity. Materials may be of two types (i)Direct Material (ii) Indirect Material. Direct material is that material which is used directly in commodity to be produced and it becomes the main part of the product for example wood used in furniture. cotton used in clothes, cement and bricks used in building etc. Thus the material that is to be applied in completing any contract or work or any process is called the direct material. B. Indirect Materials : Indirect materials are that which assist in production. It is spent for whole enterprise and not for some special unit, job or process e.g. rags and cotton waste, lubricants, used for running and maintaining the machine. Some direct materials are used in production in too much less quantity due to which it is difficult to calculate per unit cost hence these are included in indirect materials as threads, gums, nails etc. This indirect material is included in factory cost. Labour is the second main element of cost. It is also termed as wages which means the amount paid to the workers for their services. Labour is the only active force of factors of production because all other factors are inactive and they are fruitful only with the help force, called labour. A. Direct Labour : Labour is an active source of production. is also of two types (G) Direct Productive labour wages (ii) Indirect or Unproductive labour or wages. Those labour which actively take part in production or which can be identified or attributed wholly to a particular job, product or process or expended in converting raw materials into finished products is called direct labour. B. Indirect Labour : The labour who is not engaged on the actual production of the product is called indirect labour as the labour of Chowkidar, Store-keeper, Foreman, Watchman etc. Indirect labour is too included in Factory Cost. Other examples of Indirect labour are Wages of idle time, Holiday wages, Overtime wages etc. A. Direct Expenses (Other Chargeable Expenses): It includes all expenses other than direct material or direct labour which are specially incurred for a particular product or process. includes excise duty, royalty, architect’s fees, models, experimental expenses project expenses, hire charges of special equipments obtained for a contract, repairs and maintenance of plant and equipments obtained on hire, traveling expenses to the site etc. and these should added in Prime Cost. Mostly expenses spent on a contract are direct chargeable expenses. Internal transport expenses and coal used in mines and quarries, brick kilns, are also assumed as direct chargeable expenses. Prime Cost, Direct First Cost or Basic Cost is known by A. Examples of direct expenses expenses on designs of drawings or patterns or adding all the direct expenses. B. Indirect Expenses : Indirect expenses or oncosts or overheads are not related with particular production and so are called indirect expenses or supplementary expenses. Disclaimer – Friends, https://www.pdffiles.in is designed for education and education sector only and does not have own Books / Notes / PDF / and ALL Material. We only provide Link and Material already available on the Internet. If in any way it violates the law or there is a problem, please mail us – pdffil[email protected] If you need more pdf files, notes or book, then you can email us. Email has been given up. We will be able to help you as soon as possible.